Olympic Mountain view retreat is quiet, peaceful and spacious, but only 6 minutes to HWY 3 and 8 min to the mall. Close to Bangor and Keyport bases. The guest suite is in the lower level of my home, a daylight basement, with 1100 sq ft of space. Excellent for families or travelers wishing the privacy of 2 well - separated bedrooms. The double bed room has a mountain view and armoire for clothes storage. The second bedroom is more spacious with queen bed and full closet. Bedrooms have USB outlets, luggage racks, large wall mirrors and benches. The common area is a large living space with comfortable seating including 2 chair and ottoman sets and sumptuous leather chaise. Dining table has seating for 6. Roku TV and large variety of games available for family or leisure time. There are also lawn games available to use in our large backyard in good weather. The wet bar/kitchenette has a Keurig coffeemaker, mini fridge/freezer and small sink. No dishwasher, but we provide supplies and some paper plates if preferred. Toaster, hot plate, microwave and large toaster oven for meals, with pots, pans, pizza pan, some spices and supplies. Work space, WIFI, washer and dryer, guest patio and hot tub make this property a relaxing retreat! Busy professional, a Michigan transplant, who enjoys meeting and hosting travelers. Moved to WA in 2015. Part of the lure of the PNW was the beautiful Olympic and Cascade mountains and our ghostly Mt Rainier. I initially moved to Bainbridge Island, but decided I really wanted a mountain view every day. Hosting travelers helps me afford my dream home. We live upstairs of our guest suite, and although we only occupy half of the home, we obtained a ton of extra room, garage space and lovely large backyard. We hope you'll enjoy your stay! Olympic Mountain view is gorgeous is all weather, but particularly so in winter, on a sunny day, with the snow on the peaks. 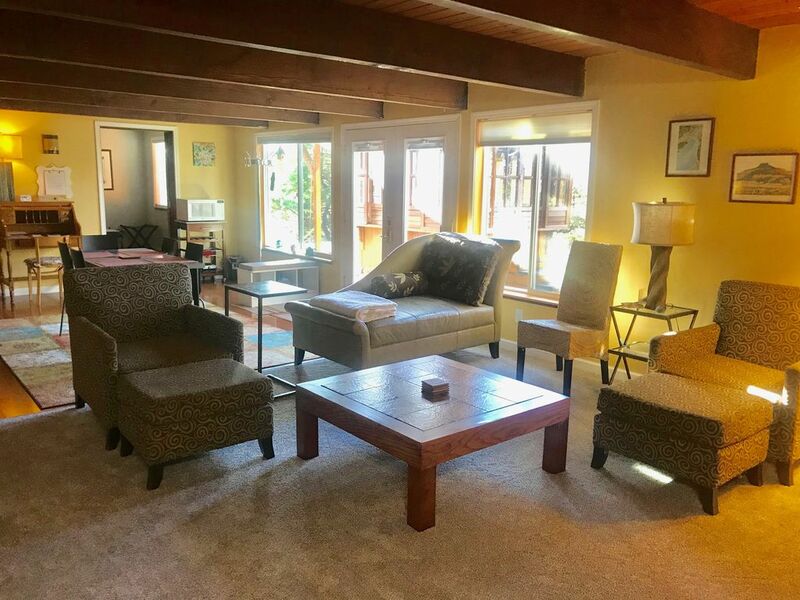 This property is in a quiet residential area, but only several miles from the highway and nearby Silverdale, Poulsbo, Bangor and Keyport bases. free-2 laundry pods provided. For stays longer than 5 nights, laundry facility may need to be shared with owner, but would be arranged. Large common room has living area, kitchenette/wet bar, dining or game table, desk, Roku TV, area information. Toaster oven can hold 12 in pizza. Some paper plates are provided, and plenty of regular dishware, pots, pans and utensils. Sink and dish soap provided to wash plates, but no dishwasher-sorry! table, umbrella, 4-6 chairs available. There is a path to the lower level of home where guests reside, with a few steps on path and a 3" step up into the double bedroom. Use caution. Please note this guest suite is in the lower level and owner lives upstairs. We enjoy greeting you on arrival when possible but also want to ensure your privacy. We are available if needed, but amount of interaction is up to you. We offer a complimentary bottle of WA wine for our guests! House was very clean and organized. Owners were responsive to questions in a very timely fashion. They even set-up the pellet stove to take the chill out of the air in the evening. Would stay there again! I loved the seclusion. Very nice place and Jan was very accommodating. We had a wonderful stay. House was extremely clean and very convenient for us working on Bangor military base.